GenericMenu lets you create custom context menus and dropdown menus. The example below opens an Editor window with a button. 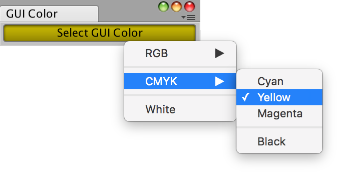 Clicking the button displays a context menu, which lets you change the color to apply to the GUI in the window. Copy the example's contents into a script called GenericMenuExample.cs and put it into a folder in your project called Editor. allowDuplicateNames Allow the menu to have multiple items with the same name. AddDisabledItem Add a disabled item to the menu. AddItem Add an item to the menu. AddSeparator Add a seperator item to the menu. DropDown Show the menu at the given screen rect. GetItemCount Get number of items in the menu. ShowAsContext Show the menu under the mouse when right-clicked. MenuFunction Callback function, called when a menu item is selected. MenuFunction2 Callback function with user data, called when a menu item is selected.